How Good is Denver’s Defense? The Broncos’ defense is incredible. It’s otherworldly. It’s unstoppable. While those three superlatives are perfectly reasonable things to say, they don’t say why the Broncos’ defense is so good. Instead of continuing on with opinion and conjecture, let’s take a look at a few statistics to determine just how good Denver’s defense is. Simple measures of defensive performance are useful but limited. For instance, the Broncos allowed 18.5 points per game this season, an elite rate. However, that only ranks fourth in the NFL, behind Seattle, Cincinnati, and Kansas City. Clearly, this statistic is unable to show how great Denver’s defense is. Instead, let’s use DVOA (check out this article for an in-depth explanation of DVOA). The Broncos’ defensive DVOA is an impressive -25.8% (remember that positive numbers represent more points so a negative DVOA is good for defenses). How good is that? First let’s take a look at a graph. This graph shows the distribution of defensive DVOA in the NFL in the 2015 season. Thirty of the thirty-two teams in the NFL are in the same cluster in the middle. The square in the upper right corner is the laughably bad Saints defense. The star all the way in the bottom left corner? That’s the Broncos. Just look at the gap between them and second place. Although it’s not quite as large as the one between New Orleans and 31st-ranked Chicago, it’s still a fairly sizable gap. That’s how much better Denver’s defense is than everyone else’s. Here’s another way to measure how dominant Denver’s defense has been: z-score. If you’re unfamiliar with the term, z-score measures how many standard deviations a given data point is over or under the average of all the data points in the sample. Denver’s z-score is -2.31. As a comparison, here are eight other notable defenses in recent years and their z-scores based on defensive DVOA. Remember, a negative z-score is good for defenses, as it means that they are successful at preventing points (or producing negative points, if you will). The Buccaneers were crazy-good back in 2002. Given a normal distribution, the chances of a defense being better than Tampa Bay’s in 2002 are just over .01%. Wow. To many, the 2000 Ravens own the title of best defense of the 21st century. However, on this list, they rank last. Why is that? Well, if you look one slot above them, you’ll find the 2000 Titans, who (obviously) played in the same season as them. Standard deviation, and, as a result, z-score, can be affected by the presence of a team of a similar caliber. Accordingly, the Ravens’ z-score is dragged down by the presence of the Titans. There’s one more way to show how great Denver’s defense is this season. Given a normal distribution, the chances of a defense being better than the Broncos’ defense are 1%. That means that you’d expect a defense as great as the Broncos’ to show up roughly once every 3.125 seasons. So, with these Broncos, you’re seeing something that only occurs about three times a decade. Although we’ve answered the titular question pretty thoroughly, there remains one, far more important question that has yet to be answered: Will this spectacular defense result in a championship? Not having a star quarterback is a significant roadblock to winning the Lombardi Trophy, but not an insurmountable one. In recent years, pedestrian quarterbacks such as Joe Flacco, Brad Johnson, and Trent Dilfer have won Super Bowls. Flacco was helped along by an extraordinary hot streak, but both Johnson and Dilfer were accompanied by excellent defenses, both of which appear in the chart above. Now, since we’ve already established that Denver’s defense is superb, it would stand to reason that they would have a genuine shot at the championship despite their lackluster quarterback situation. That’d be true if it were Brock Osweiler who were starting for the Broncos at quarterback in the playoffs as he’s been competent enough to allow them to win games. However, rather than Osweiler, it’ll be Peyton Manning starting under center for Denver. Manning, unlike Osweiler, has proven himself to be totally incompetent this season, throwing an interception of 5.1% of his attempts, an absurd rate. While great defenses can carry mediocre signal callers to Super Bowl victories, even the best defenses can’t overcome abysmal quarterbacking. 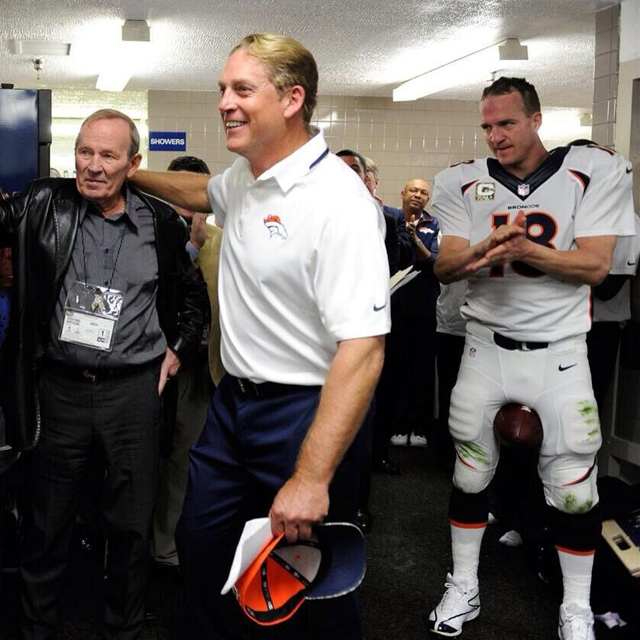 And, even if Manning were playing like he was in 2006, I certainly wouldn’t want to entrust my Super Bowl hopes to a guy who looks like he’s plotting to murder John Elway. This entry was posted in Football, NFL and tagged Broncos, Denver, Denver Broncos, DVOA, Evil Peyton Manning, Football, Football Outsiders, Manning, NFL, NFL playoffs, Peyton Manning, playoffs on January 15, 2016 by Sushi Kaplan.